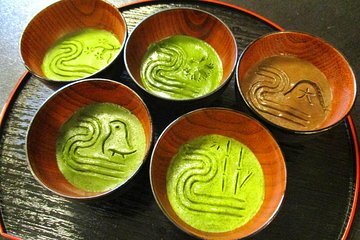 Many visitors to Japan experience the traditional tea ceremony, but not so many get to taste high-grade matcha. This experience teaches you the differences between various matcha by sampling gelato. Afterward, you'll put your knowledge to the test in a blindfolded game. 5 different kind of Gelato (You can choose the level to try the game.The flavor of gelato changes according to the level. If you want to buy our Matcha, Japanese Herb, Gelato etc, please pay for it. 1pm, 3pm, 5pm Monday to Saturday. In case, We will close our shop for an event and reservation. In this experience, I will give a lecture in English or Japanese. But also I have Chinese text book.